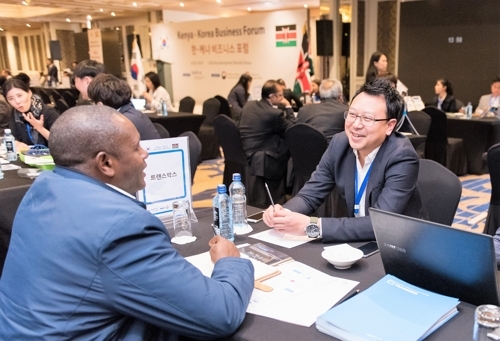 (SEOUL=Yonhap News) The Korea Trade-Investment Promotion Agency (KOTRA) held the Korea-Kenya Business Forum and Business Partnership Fair at the Villa Rosa Kempinski Nairobi in Kenya on July 20 (EAT). Korean IT companies and 23 SMEs conducted business consultations with 60 Kenyan companies. The participating companies underwent about 100 consultations that resulted in 4 MOUs and signing a contract worth USD 14 million. KOTRA signed a MOU with Chandaria Industries to activate the entry of Korean startups into overseas markets. Korean Western Power signed a MOU with Sosian, Kenya's Geothermal Power Generator, to develop the renewable energy business. KT donated smart watches made by Korean-SME Dot for the visually impaired in Kenya and Krico delivered a medical incinerator to the Kenyan National Blood Center as part of a series of cooperative events. Korean Prime Minister Lee Nak-yeon and Kenyan Cabinet Secretary in the Ministry of Information and Communications Joseph Wakaba Mucheru EGH attended the event to celebrate the opening.